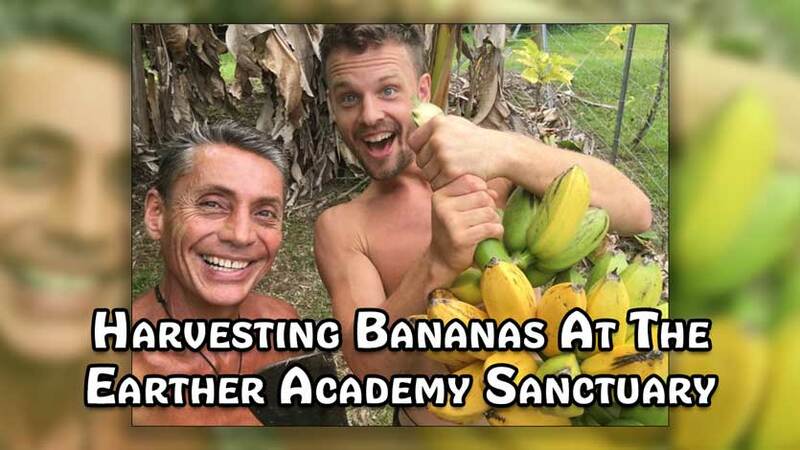 Harvesting Bananas at the Earther Academy Sanctuary – We are in the backyard of the Earther Academy Research Institute and we are harvesting some Organic Bananas that are homegrown but very easy to grow in the tropics. The natural simple understandings and “permaculture” idea is that we might be able to get another free generation of bananas that traditionally is not understanding that this is so. If we cut the fresh banana stock just at the right height and at the right 30-45 degree angle of the dangle, the plant will usually regenerate itself very easily and give you more food because you are a little smarter than previously. Organic Bananas are full of potassium an other minerals that are essential to our health and wellness. Real Bananas are a true miracle of Nature (not the gassed ones from Costa Rica, Costco or your friendly local international supermarket). The high amounts of potassium makes us very happy since most of us are deficient of this essential mineral. Real home grown bananas contain high levels of tryptophan (yes, the same compound found in turkey that gives you that relaxed, chill feeling). Tryptophan converts to serotonin in the body, the neurotransmitter in the brain that gives you that happy mood, and helps you sleep. Bananas are also high in Vitamin B, which can aid in warding off depression. Vitamin B helps conserve that tryptophan in your body, giving you more benefits of the serotonin. Not only can you eat the flesh of the banana but you can eat the peels and use the leaves for many healthy purposes. If we go back to the old world then we already knew these ideas and concepts of Nature and all of what it could provide. Grow your own food when you can and make sure you follow some of the Terrain Modification Protocols, Practice and Principles to regain your health and to get more in your “Life Stream”. To Become Your Own Doctor is the main directive of Earther Academy Are you up to challenge to Be-COME more and complete than you are? Recommended Course and Categories: Gardening, Growing Living Foods and Introduction to Quantum Exercise and Coconut The Nectar of The Gods. TransHumanism - Are We Being Programmed for the Future?